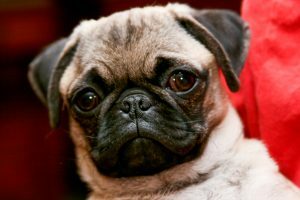 Pugs are a fun, unique breed of dog that is popular among people that love the toy breeds. The pug head is round, with a square body, with an awesome curled tail. Wherever these dogs go with that cute wrinkled face, and a great personality, well they just really charm people. His sweet temperament makes him really great with other dogs, children and cats. The pug also looks like he is always worried about something, but don’t let him fool you, he’s very happy. They live for fun which is why they have such an enduring popularity. The pug was bred for Chinese Nobility as companions, but today they are just fun loving little house pets. This dog is the happiest when he’s spending time with family. When they go for an outing everyone falls in love. Muscled and compact, ideally this dog should weigh no more than around 20 pounds. He has facial feature’s, like his flat face and his abundance of wrinkles. They can’t take a lot of temperatures even in the low eighty’s can be to much for this type of dog. That’s why they must live indoors. These are not outside animals. Pugs don’t require a lot of grooming, which makes him an easy care for pet. They really don’t need a lot of exercise nor can he tolerate it. Facts: This dog is the largest of the toy breed dogs. He has a very alert nature, which makes for a great watch dog. They also snore and snort because of their flat face. Pugs were probably from China, but no one knows where they actually they came from. Some people believe they came from Holland, from traders that were Portuguese around the 16th century. They became very popular to Kings and Queens. Only noble people had these dogs back then.